The term “rocky road” can of course refer to an actual road covered with actual rocks. It’s also used metaphorically to mean rough times, and meta-metaphorically as the name of multiple desserts. In North America, the term most often refers to chocolate ice cream containing marshmallows and either almonds or walnuts (walnuts were apparently the nut used in the earliest recipes, though almonds later became more common). We know rocky road ice cream was invented around 1929 in Oakland, California, though there’s some disagreement as to whether it was created by William Dryer or George Farren of Fenton’s Creamery. In any case, the flavor’s name is said to have referred to the Great Depression, the idea being that one rocky road can make another feel slightly less awful. 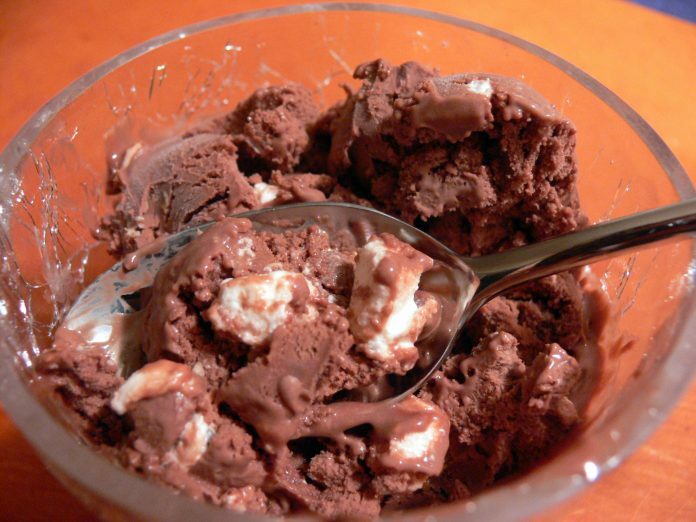 However, long before rocky road ice cream existed, there was a popular non-frozen dessert in Australia called rocky road, which also included chocolate, marshmallows, and nuts. Today, on National Rocky Road Day, I wish you a figuratively smooth road and a literally chunky dessert.